Thunderbird can be connected to Exchange. Can Thunderbird be used as an MS Outlook alternative? Which email client can use Exchange protocol for email? Is there Exchange support in free email clients? I would love to say yes to all three questions, but the truth is a little bit complicated. First, why would you use another client and not Outlook? One reason is price, not every department really needs to use MS Office. MS Office is expensive. MS Outlook only? Well, MS Outlook can also be expensive for some companies. If you are using Linux you know that Microsoft Office or Microsoft Outlook for Linux does not yet exist. What ever the reason, if you need exchange support on third party email client on Windows machine, there are only 2 options. First option is DavMail which is a proxy between MS Exchange and your client of choice. You set up your email client with imap or pop3 and smtp and Davmail relays that information to Exchange server via Exchange protocol. The other option is Mozilla Thunderbird with a commercial add on. That Add on is called ExQuilla. For $10 a year, Mozilla Thunderbird gains Exchange support for email and contacts. Seting up account is quite easy and the only missing feature is automatic account set up. Plugin could query AD to get information about logged in user and populate account information automatically. I am sure one day it will get this feature, while not essential could save couple of seconds to technician / user configuring email account. First you have to install plugin. You can do that by searching for plugin via Mozilla Thunderbird plugins dialogue or pointing location to plugin saved on your hard drive. Restart Thunderbird. Now you can set up your exchange account. 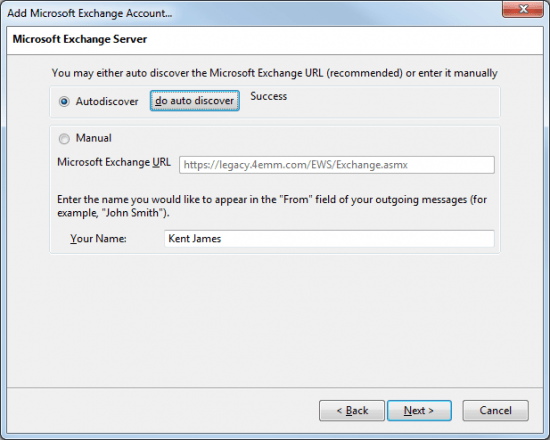 Once you enter name and your email, you have to enter your MS Exchange information. The whole process takes about 3 – 5 minutes, which is not bad. Thunderbird is then transformed to MS Exchange compatible email client. It works great and you gain access to GAL with autocomplete. The only 2 missing features are Calendar and Tasks. In the past there was an addon called Exchange EWS Provider Add-on for Lightning. Unfortunately author stopped plugin development. Imagine that you rely on such plugin and you discover that it’s not compatible with latest release. Thankfully ExQuilla author, Mr. Kent picked up where original author left and started a fork. While still in beta, It has support for Office 365 and Exchange 2013. There is a hope that it will become a complete product. $10 per year is a not a lot for Exchange compatibility. There are 2 types of licences, Domain license where you buy X ammount of licences for one domain. License is assigned automatically when new user is created. Named user license where you have notify all the emails that will be used for X amount of purchased licences to ExQuilla. We have a trial of 20 Thunderbird users with Equilla addon, in 8 months so far, there were no issues. Most users like Thunderbird once they get used to it. Mozilla foundation is funded by donations of it’s users. Or at least most users think so. Mozilla corporation, owned by Mozilla foundation receives about 80% of money from big corporations like Google, Yahoo and Microsoft. In 2005 it earned a whooping 55.000.000 (million) dollars. From 2012 – 2014 Mozilla foundation received 900 million – 300 million annually from Google in order that Google is default search engine. In July 6, 2012, Mozilla announced that they will stop financially supporting Thunderbird and transfer development to become community driven project. According to mr. Kent James, founder of ExQuilla, Mozilla Thunderbird is used by approx. 20.000.000 users. How come that organisation which has a product with 20 million users doesn’t care? Perhaps the reason is lack of innovation and ideas. With web email services like Gmail, Hotmail and Yahoo mail, is there a place left for normal Email client? What about companies? Would they pay for email client? The answer to both questions is a definitive yes. Email clients like Airmail, MailMate, Mailpilot and Postbox (Thunderbird fork) are example that you can earn money with Email client and that yes, you can innovate. We used ExQuilla in our company but have since moved to the email client which can replace MS Outlook completely but for much less money. It’s called eMClient. It has a great look, doesn’t have a mailbox database corruption issue, doesn’t have a slow archiving problem. In fact, it’s the perfect Outlook replacement. Unfortunately for Thunderbird, future is unclear. 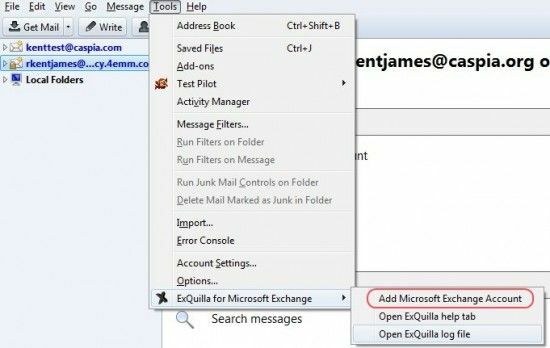 I hope that ExQuilla gains enough sales to fork Thunderbird and builds a great Outlook alternative.